When I�was thinking about introduction words to this invitation I�wanted to write something bombastic� something like� �the most succesfull central European 8bit party�� Well, it could be true, but in my humble opinion it?s�still not so bombastic. Still we could get more visitors, from more countries. More contributions. Better quality of demos. Still there is a lot to improve on our public relations, brainwashing strategies, whatever ;-). I�wanted to write something attractive, persuasive, which could attract your attention and get you motivated to support this party. But I�feel it?s�much better to state just pure facts and post few photos from the partyplace. Thanx goes to all FOREVERANS � who visit this party every year. You know who you are. Thanx also goes to ROLE, Anonym, Bugjam, Brainstorm, PCH, JakTrip, Thunderblade, POL and many many more for moral and physical support. Next to nonstop Demoshows, every year we do something special for you all. 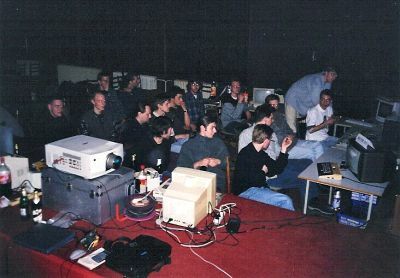 In 2000�it was spoken presentations of all plattforms and their features and presentations of latest game productions.. 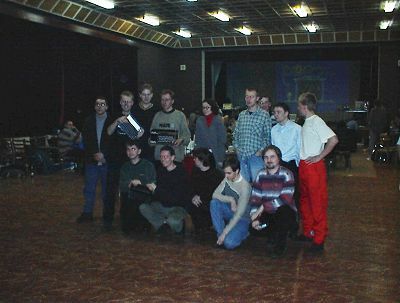 In 2001�it was special feature presentation of the largest C64 game project ever Newcomer�� RPG by Enhanced Newcomer Team. 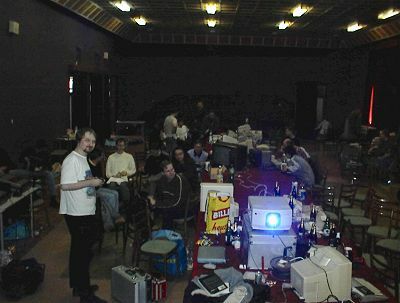 In 2002�it was live presentation of Metal Dust�� shot?em up for SuperCPU. This year we plan to show the best demost of the last year (Insomnia and Loaded will for sure be the highlights of the show), plus the latest game productions by Covert BitOps and Protovision. General rules: your presence at the party is not required�� but is warmly welcome (and it?s�nice to have your moment of fame, isn?t it?). You should have a friend at the party though, to take your prize in case you win�any. Only one entry per musician and gfxian. 1K intro:. Warning! This is the specialty of the Forever party! The intro competition is 1024�B, not the more common 4K. Be sure to count with this before you bring your intro!!! SID music: Must be an executable file. Music must be original composition, no cover or remix. 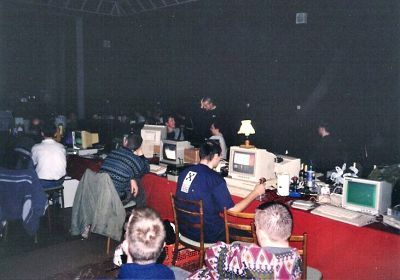 If you?re absolutely sure that your entry will sound best on the old SID, let us know when submitting..
Last year we had 34�tunes in the music compo for C64 and that means that for C64 music compo we introduce the following policy: We won?t do pre-selection. Every tune will be played, but if we get too much entries we keep the right to play them from 1,5�to 3�minutes depending on the reactions of the audience. Graphics:. Must be an executable file in whatever graphic mode. Create your own original image. Wiring (software conversion) of images which originally weren?t made for C=64 and didn?t use C=64 color palette, is not encouraged. The scene is annoyed by this already. 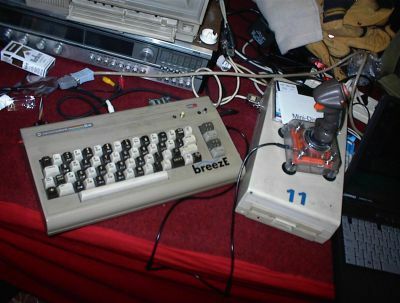 Graphics must be of the standard C64 screen size, no scrolling pictures are allowed. 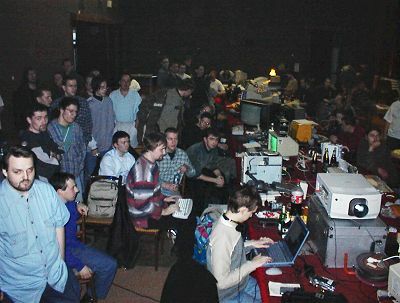 Demo competition: has just one rule�� it should be executable on C=64 and 1541-II disk�drive. System of voting: Each entry can get 1�9 points. The better the entry is, the more points it deserves. It?s�a lot of work for organisers to count the votes, but the results are fair and unaffected by the usual delays between the compo entry presentation and voting. You don?t have to make any temporary top-lists or anything, just individually assess the compo entry immediately after you saw/heard it. We will present graphic entries in 2�rounds in order to assure that people can first estimate the overall quality of the compo entries and then evaluate the single entries accordingly. We?ll send lastminute info about rulez to all registered visitors from all years through e-mail. at the time when I?m writing this counting 87�signed and 82�visiting people. 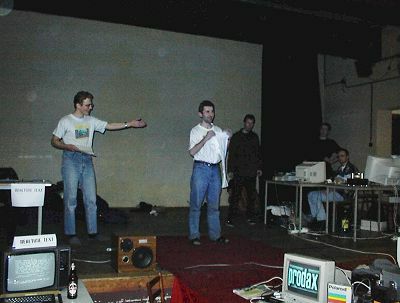 Thanx to PCH (C64 scene) and POKE (speccy scene) for photos from partyplace. 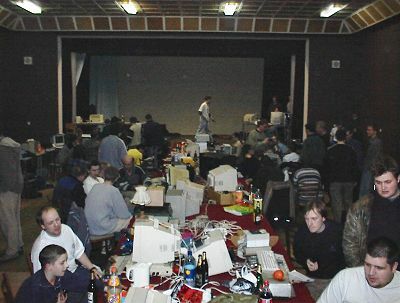 Forever Quattro C64 section is organised by DMAgic team : Wotnau, MacGyver, JakTrip and CreaMD. This article has been displayed for 1595 times, since publishing.